The condition keratoconjunctivitis sicca is commonly called dry eye because the disease is actually a dysfunction of the glands of the eye that produce tears, causing a dry eye. Tears are responsible for keeping the cornea healthy and without tears the cornea becomes diseased. The condition is most common in dogs with large round eyes such as Shih-Tzus but can occur in other breeds as well. Signs include very red inflamed eyes with a thick ropey type of mucus on the surface of the eye. The pets are often very uncomfortable and will frequently rub their face on the carpet. The corneas will often ulcerate and the pet will squint from the pain. A simple test called a schimer tear test can be done quickly in the office and will provide immediate diagnosis allowing for quick treatment. The test involves placing a small paper strip (that has a numbered scale on it and blue dye at the bottom) under the lower eyelids. If adequate tears are present the dye will wick up the paper and the number is recorded. If KCS is present there will not be enough tears to wick the dye up to the proper level and KCS is diagnosed. 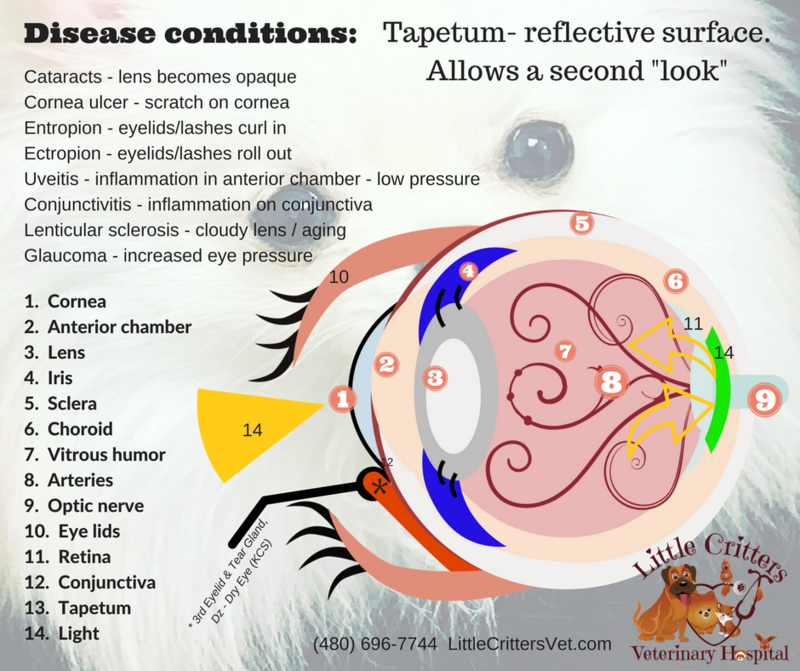 Once diagnoses pets are treated for with a medication called optimmune (various strengths) the ointment is applied into the eye daily for the life of the pet. With most pets this treatment alone is enough to control the disease as long as the owner understands that it is a lifelong treatment and continues the administration of the medication.